A fallen piece of Mistletoe that is still attached to the host species. The horizontal twig is the host and the vertical one is the Mistletoe. 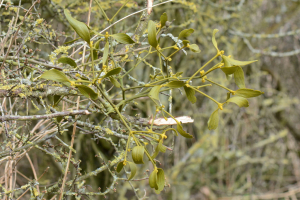 I didn’t know how Mistletoe attached itself to its host or really think that hard about it as it is generally out of reach to see properly. However the joint seems as though they are one and looks very strong. Does anyone know how this process occurs.